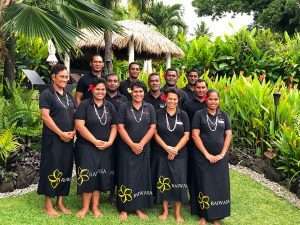 Your on-site managers Richie and Rosie guarantee an unforgettable experience at Raiwasa Grand Villa, raising the word pampering to new heights of excellence. From the moment you arrive full of wide-eyed expectation until the moment you leave (wishing you didn’t have to go) this duo head up a team of 12 that’s totally dedicated to taking care of your every need. Together they deliver an experience that goes beyond five star—an experience that’s personal and discreet and tailored to your personal preferences. 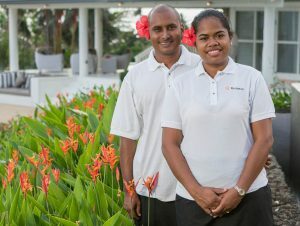 It’s experience gained from more than 20 years of service at prestigious five star resorts, restaurants and hotels in both Fiji and the Cook Islands, including the renowned 5 star Grand Pacific Hotel, Nautilus Resort, the Rarotongan Beach Resort and Spa, Taveuni Palms and Paradise Cove resort. Before entering the hospitality world Richie studied business and astronomy at the College of San Mateo in San Mateo, California. When he returned to his native country to study at Fiji’s School of Hospitality and Tourism Rosie was in the same class—and they have been together ever since. If you stay at Raiwasa Grand Villa, Richie and his team will be your dedicated chefs introducing you to the gastronomic delights of dishes influenced by the different cultures of the Pacific region while also embracing your own personal preferences. If you’re interested, they love to share their culinary techniques with guests using locally grown, fresh, and mostly organic ingredients. Both Richie and Rosie are extremely knowledgeable about the island of Taveuni and thrilled to share their insider secrets. They have three children, Riya, Robert, and Rachel, and Rosie is an experienced nanny, should you have need. Richie oversees the villa’s skilled staff, who are so quiet and efficient that you will rarely notice their presence.